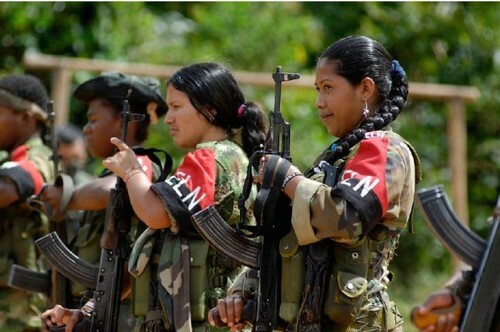 Guerrilla fighters from ELN in Colombia. A Colombia guerilla group is trying to draw Ottawa into its battle with a Toronto-based mining company which is quietly trying to secure the release of one of its executives who has been held hostage since January. The Ejercito de Liberacion Nacional (ELN) kidnapped Gernot Wober, 47, on Jan. 18, during an attack on the Snow Mine camp in Bolivar state, which sits in the northern part of the country. The guerilla group kidnapped five other people, including three Colombians and two Peruvians, who have all since been released. The guerilla group says that Wober, the vice-president of Toronto-based Braeval Mining Corp, won’t be released until the company gives up gold mining concessions in the San Lucas mountain range which the ELN claims were initially given to local miners who live in the area. In a statement issued Wednesday and posted on the guerilla group’s website, the ELN took aim at the Canadian government. The ELN claimed the Colombian government was increasing military operations against the group to secure Wober’s release. The ELN is the smaller of Colombia’s main guerilla groups. It’s estimated the ELN has between 2,000 to 3,000 guerilla fighters. A spokesperson for Braeval said the company has been advised not to comment on the kidnapping. Foreign Affairs emailed a statement to APTN National News saying federal government “officials continue to work closely with our partners on the ground.” The statement said officials are also in contact with Wober’s family. The ELN has released no evidence to back its claims that Braeval wrongly obtained the mining concessions. According to his on-line work history, Wober has extensive experience in the mining sector, including involvement in projects in the Yukon, the Northwest Territories, British Columbia and Manitoba. The activities of foreign mining companies, including those based in Canada, have long been a point of contention among Indigenous and local communities in Colombia. Under Canada’s free trade agreement with Colombia, Ottawa is required to present an annual report on human rights in Colombia every year. Last year’s report failed to report on human rights in the country. The National Indigenous Organization of Colombia (NIOC) has called on Canada to pressure the Colombian government to respect Indigenous rights in its mining laws. In a recent interview with Maria Patricia Tobon Yagari, a lawyer with the NIOC said that mining companies present a bigger threat than the armed groups because the firms fuel the violence. “The presence of these miners have reinforced (the violence) because they have benefited from it. By using private security they have forced these Indigenous groups and Colombian campesinos to resist and it has increased the violence in the territories,” said Tobon Yagari. Tobon Yagari was scheduled to appear on Parliament Hill on May 22 but her visa was initially denied by Ottawa. Tobon Yagari said foreign mining firms have put pressure on the Colombian government to pass mining laws tailored in the interest of development. Many Indigenous communities in Colombia are clinging precariously on the edge of extinction. Of the 102 documented Indigenous nations in Colombia, 32 have populations under 500, 18 have populations of 200, while 10 have less than 100. Tens of thousands of Indigenous people have been displaced from their territories which are often rich in minerals and hydrocarbons eyed by foreign mining firms. Amnesty International has said it’s concerned about deepening ties between Canada and Colombia’s military as a result of the free trade deal. “And recent changes to export controls in Canada to allow for the sale of automatic firearms to Colombia,” have added to list of problematic issues, said the international human rights organization. The situation of Indigenous peoples in Colombia is so dire that the UN Special Rapporteur on Indigenous Peoples James Anaya has called for the UN special advisor on genocide to visit Colombia. Posted on June 8, 2013, in Mining and tagged Braeval Mining Corp, Colombia, Colombia Indigenous, Ejercito de Liberacion Nacional (ELN), Gernot Wober. Bookmark the permalink. 9 Comments. Get the heck out of Columbia Braeval.. This land does not belong to you. Your destruction of the home of these people is deplorable.. Shame on Toronto..